I have these. They are little fruit snacks. A tiny bit like gummy bears, but not really the same. And they really arn’t as sweet as you would think. I understand fully, but they do have their merits. Maybe not to one that is so far into the *ahem* abyss. I actually discovered these one day at the grocery store and decided to appease the Hello Kitty fan in my life. We both enjoyed the “fruit” flavours, but it was I who enjoyed the carnage on gummy scale. Even though the HK fan here isn’t at the level yours seems to be, it was just as enjoyable. this kitty’s to you! These gummie snacks were given to me by my roommate. They are SOOOO gummy. They stick to my teeth forever. I can’t get the goop off without brushing or just leaving it to slowly dissolve on its own. they’re tasty but so not worth the mess that stays on your teeth. I ate those before, but they are so gross!!!! Maybe I should never eat anything Hello Kitty again. My boyfriend got me those! So… I’ve read about half of this blog so far (damn place is like a train wreck…) and I have to wonder, does your wife visit your site at all? I like em – they are the best fruit flavored snacks on the market. Everyone I have shared w/ them love them as well … I like that they are not that sweet. I bought those! The Kitty nazis eat them at the Eastern front for rations,err. I give them at Hello Kitty ween. 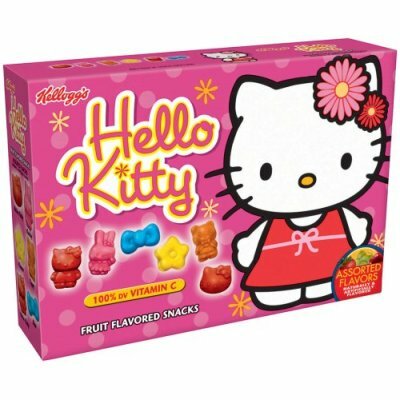 Any time we go on family trips, my father specifies that we should get the Hello Kitty fruit snacks for me, since I like fruit snacks. I’ve had these, and they are some of the better fruit snacks that I’ve had. Explaining them to the guys I work with…..Well, it helps that they already think I’m a bit weird. I guess it doesn’t bother me too much anymore. Age (50)has a way of giving you an “I don’t care what they think” attitude. I have had these. I really love the detail that you wouldn’t normally get in most fruit snacks. They also have nice colors. Yes Hikaroo, the bows are the best! When my mother worked for Kellogg’s, we got a different kind of fruit snacks packed in our lunch every week. I remember the Hello Kitty ones being especially fun – with a little spit you could mutilate them into things like Two-Headed Kitties. Yes!!! You could live entirely on Hello Kitty food!!! Or you could lock your wife in an apartment and have her live entirely on Kitty Food, and Denpa Shounen Sunday could film the whole thing. these also come in other shapes, like xmen and random fruits. They’re nowhere near as sweet as other fruit gummies, though that flourescent packaging… well. That I can’t say anything about.